Prizes are granted to eminent scholars for achievements, which shift cognitive boundaries and open new perspectives for research. 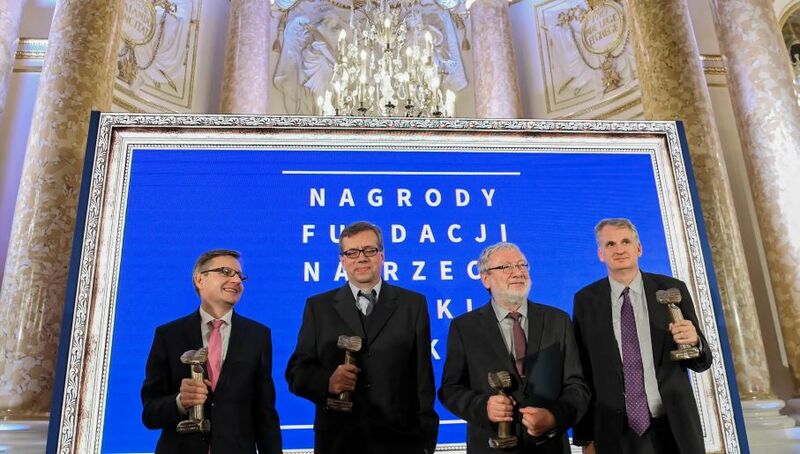 Professors Andrzej Dziembowski, Andrzej Gałęski, Krzysztof Pachucki and Timothy Snyder are this year`s laureates of the Foundation for Polish Science FNP) Prizes. This is one of the most important Polish scientific distinctions. It is an individual prize awarded through a competition in four fields: life and earth sciences; chemical and material sciences; mathematical, physical and engineering sciences; and social sciences and humanities. Prof. Andrzej Dziembowski from the Institute of Biochemistry and Biophysics of the Polish Academy of Sciences in Warsaw has won the prize in the field of life and earth sciences for explaining the function of key enzymes involved in RNA degradation, the dysfunction of which leads to pathological states. His discoveries have led, among other things, to a proposed new therapeutic approach in the treatment of bone marrow cancer (myeloma). In the field of chemical and material sciences prize was granted to Prof. Andrzej Gałęski from the Centre of Molecular and Macromolecular Studies of the Polish Academy of Sciences in Łódź, for developing a new mechanism for plastic deformation of polymers. His work has led to the development of super-strength plastics long-awaited by the aviation and automotive industries. Prof. Krzysztof Pachucki from the Faculty of Physics at the University of Warsaw has won the in the field of mathematical, physical and engineering sciences for precise quantum electrodynamic calculation of spectroscopic parameters of lightweight atoms and molecules. These findings are the basis for precise determination of fundamental physical constants. For the first time this year, the FNP Prize has been awarded to a foreign scholar. Prof. Timothy Snyder from Yale University is a historian, whose interests include Polish problems. He has won the prize in the field of the humanities and social sciences for the analysis of the political and social mechanisms that led to national conflicts and genocide in Central Europe in the 20th century. Prof. Snyder`s research has provided a new dimension to the 20th-century history of Central & Eastern Europe. The FNP Prize has been awarded since 1992. Including this year's winners, there are 99 laureates of the FNP Prize.